Print square photos of family, travel memories, or simply artistic square photo prints. Starting from 12x12 inch (300mm) you can print square photos in stunning high quality. Our square photo prints will make modern, stylish room decor. Simply upload your original photo files, and use our online tool to crop your images. 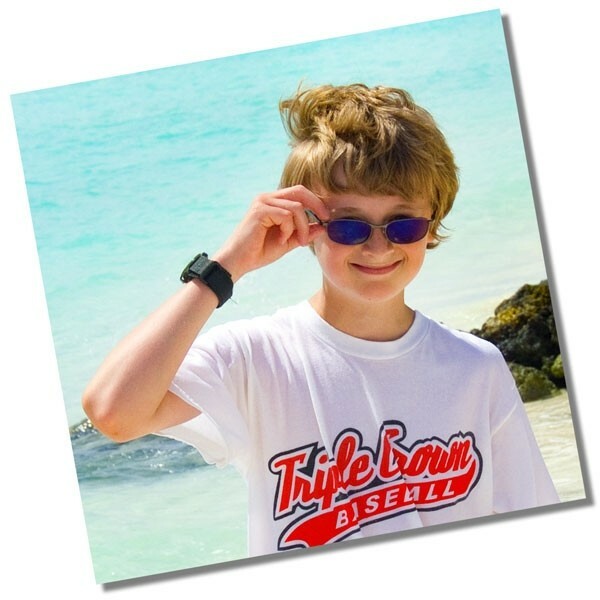 Print square photos of family, travel memories, or simply artistic square photo prints. Starting from 12x12 inch (300mm) you can print square photos in stunning high quality. Our range of square printing sizes will make modern, stylish room decor. 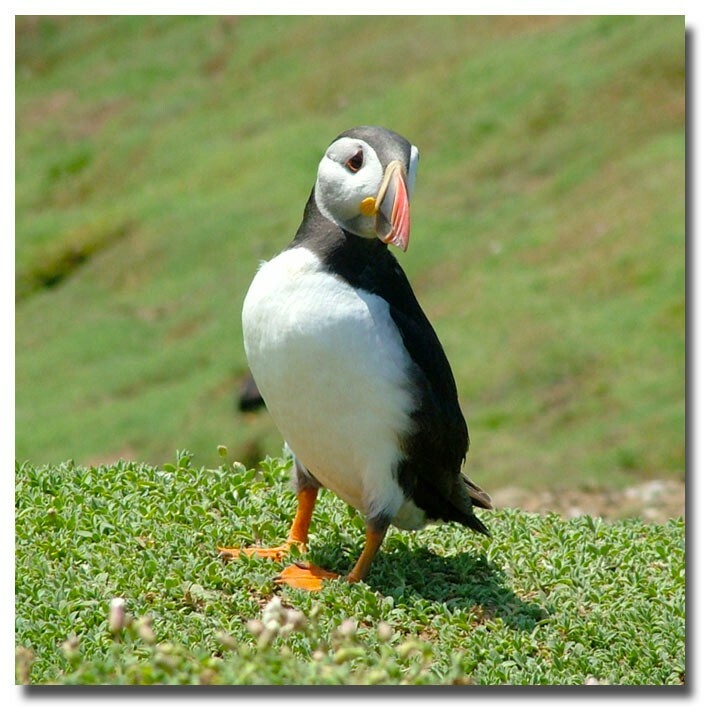 Simply upload your original photo files, and use our online tool to crop your images. If we have any queries on your order, such as the quality of your photo, we will contact you via email before proceeding to print. 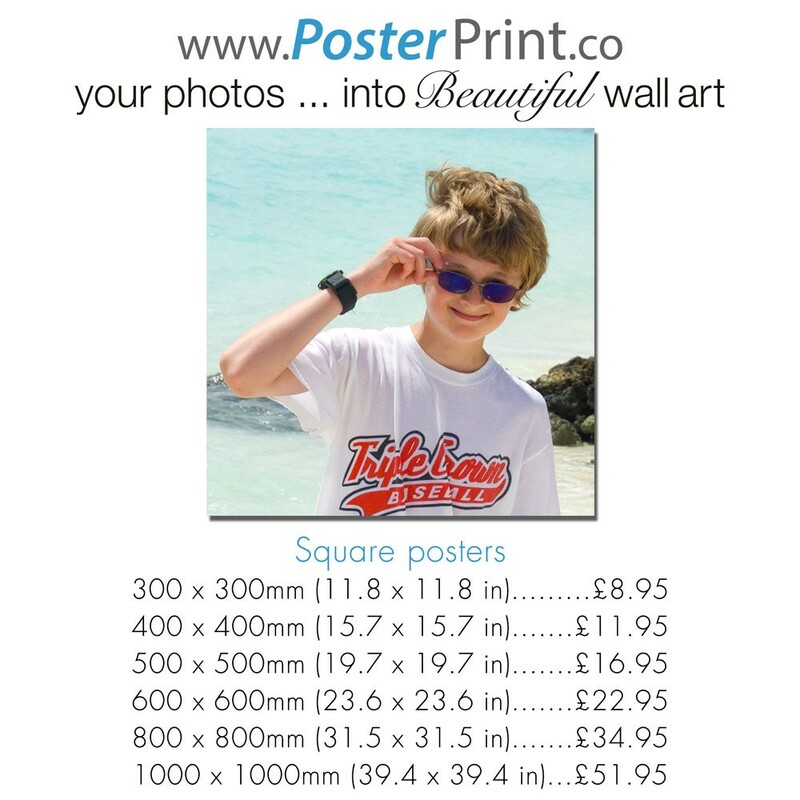 Simply upload your photo to make decorative large poster prints. Whether it be sunsets or sunrise, seaside or desert your personal photo can become a work of art to enhance any room. Upload photos from your iPad, iPhone, mobile device, pc or mac. At Poster Print Co, we produce high quality poster prints for wall art in the UK. Our poster prints are a fine way to display your digital photos. We print and dispatch next day, making our service fast and reliable. We specialise in creating beautiful poster prints from your very own photos, images and pictures. We believe quality can be affordable and our poster prints are of the highest standards! Putting your photos onto posters is a great way to show off your favourite images. Poster prints are an affordable way to showcase art, photography and commercial images in large format from 12x12 (300mm). Our poster printing service is used by professional photographers, interior designers, businesses and individuals alike. Questions? - Read about our Photo Poster Prints. Our website will normally upload and create a thumbnail for photo files up to 200Mb. However, occasionally photos will have difficulty due to internet speeds. When this occurs, please see our file upload help page . We can accept jpg, tif, illustrator and pdf files, please contact us if you have any difficulty. We are also happy to accept Photoshop or RAW files, however these cannot be processed through the website. Simply email us your photo with your requirements: Size & Paper Type. We will process your order manually and email you a bespoke payPal invoice (credit/debit cards accepted). If your file is large, please see our Large Photo Upload information above. FAST SERVICE - NEXT WORKING DAY DESPATCH. Postage & Packing: £3.95 per order. Free Delivery on orders over £60.00. Square Photo Prints - High-quality print, delivered quickly at a very reasonable price. Recommended. Print Square Photos - We ordered wedding pictures to display in our house and the service was so fast! Ordered and then shipped later that day and received the next. Great quality too! Thank you very much. 12x12 Square Prints - Great service once again thank you! Square photo prints. Great quality and delivery time quick. Just what I was looking for...a reasonably priced square poster that didn't compromise on quality. Super product and service used a few times now and always speedy delivery. We use these posters for square picture frames and they look great thanks poster print! We will be ordering more soon! Really happy with the print plus got it the day after I purchased it! Received this morning - wonderful service - will recommend to friends and colleagues. Thanks. A very quick turn around and I was really pleased with the result. Would certainly recommend. Excellent Service, quickly resolves problems not of their making. Excellent Service. We had some damage to the first picture that seemed to be caused by the Mail company. I contacted Poster Print Co who checked out the problem and sent me another copy. The print is top quality. Very happy with the quality. Excellent service. I am so impressed with the print. I chose a 600mm x600 mm and I was a little worried about the clarity of the image. However the print looks so good. I will be buying more. Absolutely excellent service and excellent quality prints. Our travel shots look amazing in our square mounted frames and are now a lovely reminder every day of our holiday memories thank you very much!! Quick buy and good quality. Thank you for processing our order this week so quickly. The photos are lovely and the quality is excellent. Superb quality product and great service. No other company was willing to provide a square print of the size and quality that I required, however posterprint.co were extremely accommodating and provided not only a great product but a great service. I received the poster today! I must say, the quality is outstanding and the service and speed is something I have never experienced. We received the prints today, can't thank you enough they are absolutely gorgeous and taking pride of place on the wall. Thank you so much for such a good quality speedy service. It's just arrived and its lovely. Thank you. Ordered online on 18th October with standard sized photos, received an email within 30 minutes to proof the square version, wanted one changing which was done instantaneously, received prints on 20th October, absolutely fantastic quality and service, couldn't be happier. Thank you for sending my image so promptly. I like the border and the whole thing looks great. I was really impressed with the quality of the prints! Having had bad luck with enlarging photos in the past (poor resolution etc) my expectations were low, but they really were amazing. Received personal, extremely helpful customer service and was sent the posters within 2 days of ordering! I'll definitely be using posterprint again and will be recommending it to my friends and family. I created some artwork for my 2 year old son's bedroom, with the final prints being 40cm x 40cm (4 different prints in total). Posterprint came recommended to me, and I have to say that I have not been let down. I'm extremely fussy (being a graphic designer) and honestly cannot fault the quality of the prints. Customer service has been top notch, and my son loves them!! I would definitely use posterprint again.